This is a fully automated multi-currency Expert Advisor with unlimited number of currency pairs using MACD and Envelopes indicators. You can specify how the EA should work with each currency pair. You can add orders manually. Real account fully managed by the Expert Advisor. OrderPanel: display the panel for opening orders. TradeToBalance: target balance to stop trading. The parameter is triggered only after all trades are closed. Otherwise, it continues opening orders to return to normal before closing deals according to one of the conditions below. 0 - trade with no limits. MagicWork: work only with the EA's orders or with all orders. Trading: type of trading, Netting or Standard in the directions specified in TheMainPair. TakingOrders: Fixed - fixed, Floating - floating, Percent - percentage of the balance, NoTake - do not open orders. OrdersTake: the maximum number of open trades in one direction for one currency pair. PauseMinute: pause in minutes when closing all orders. Lot: lot size; if Percent is used, specify the percentage. PlusLot: lot size is added to the next order, +PlusLot. MaxLot: maximum lot, limits when using Floating and Percent. MenuMinusOrder: lot to be closed; if 0, then close fully. AnalysisOrders: the maximum number of orders in the database, 0 - unlimited. AnalysisBar: the number of bars to process, min:5, max:500. 1. Changed the saving of the values of the opened orders. They can now be saved in files or global variables. 2. Added the ability to send push notifications or emails when receiving profit. Fixed partial closing of a loss-making lot. 1. Added the ability to partially cover the unprofitable lot. This allows coping with drawdown more quickly and smoothly. Implemented as the MinusLotClose parameter. 2. Added the ability to trade with preliminary analysis of trades. It creates a custom database of successful virtual orders. And if the corresponding parameters are met in the future, a trade order is opened. 1. The Custom Moving Averages indicator has been replaced with Envelopes, which enables a more accurate setup of market entries. 2. Added a panel for opening trading orders for currency pairs allowed for the EA operation. 3. Added a parameter allowing/prohibiting order opening. So now t is possible to run multiple EA instances on currency pairs with different settings and to perform general multicurrency monitoring if necessary. 4. New Trading parameter has been added - it instructs the EA the mode of operation with currency pairs selected in "TheMainPair". This parameter is convenient for use on accounts where hedging is prohibited. If set to "Netting", you should take into account that there should be an even number of currency pairs, and each pair should be appropriate for hedging when working in different directions. 5. The formula for calculating the profit when closing all orders has slightly changed. Now the coefficient of the total number of orders is used. Added the MACDnoOpen parameter to the EA's settings. The number of points from 0 to not open positions. It sets the corridor, where it is not allowed to place orders between zero and the value of the MACD indicator. For BUY below 0, for SELL above zero, respectively. for a 5-digit currency pair, it will be 0.000025, for 3 digits - 0.0025 and so on. 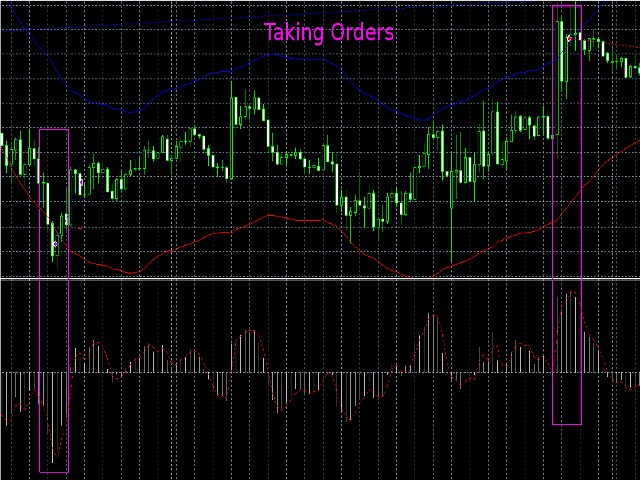 This is due to the fact that Digits of the MACD indicator is equal to Digits of the currency pair plus 1. If the EA is configured for multicurrency trading, the prohibition corridor will be calculated for each currency pair individually, based on the number of decimal places of the MACD indicator for a given pair.